SUPPORT LYRIC ARTS ON GIVE TO THE MAX DAY, NOVEMBER 15! We would love your help to meet our $15,000 goal on Give to the Max Day! There’s never been a better year to be a part of this great Minnesota tradition! Give To The Max is a special day to support your favorite Minnesota nonprofit organizations—and we hope for you that includes Lyric Arts! This Thursday, November 15, your gifts will go further than ever, thanks to a $2500 matching grant from our community partner, VStar Entertainment Group! It’s also the 10th Anniversary of Give To The Max, and to celebrate, GiveMN is giving away over $130,000 in prizes to nonprofit organizations. Every time a fan donates to Lyric Arts on GiveMN, it means another entry for us into that drawing! You could be a winner too! VStar Entertainment Group has also donated a 4-pack of tickets to PAW Patrol Live! [link: pawpatrollive.com], and everyone who donates to Lyric Arts between now and the end of the day on Thursday will be entered into a drawing to win! STOP IN TO MAKE YOUR DONATION IN PERSON! 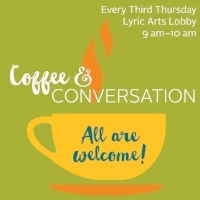 This Thursday also happens to be our monthly Third Thursday Coffee & Conversation gathering from 9:00 – 10:00 a.m. in the lobby! We’ll be serving coffee and pastries, giving backstage tours, and hearing from Warren Sampson, who will talk about his process for composing the original music score for our next show, Prancer, which opens this week! Everyone is welcome! WE HOPE YOU #LOVELYRICARTS AS MUCH AS WE DO! Be a part of the fun, and be sure to support us, on Give To The Max Day this Thursday, November 15! Post a selfie video telling people why YOU #LoveLyricArts on #GTMD18. Be sure to tag us or “check in” at Lyric Arts. Then, watch our Facebook page for exciting updates and videos all day long! You just might see your video featured!